For more than half a century we've known that controlling blood pressure (getting the numbers below 140/90) is important in preventing heart attacks, strokes and kidney failure. The so-called SPRINT study that was just stopped tells us that lowering the systolic blood pressure (the top number) to 120 or lower is even better in preventing complications and death from cardiovascular causes. While we wait for the study details to be published in a medical journal, the news about the study has given me pause. How low should we go and for how long? I think about a patient of mine in his 80s. For decades, he's taken a combination pill (two medicines in one) to keep his blood pressure below 140/90. Six months ago, he told me that he'd been having episodes of lightheadedness once or twice a week. That's a common side effect among older people taking blood pressure medicine. "It's as though I'm just going to pass out," he told me. "My vision fades and I get wobbly legs." Fortunately, his episodes had passed without him actually falling. He and I agreed that it would make sense to try stopping his blood pressure medicine for a month and see what happened. The pause would be something we doctors call a drug holiday. My patient agreed to buy a home blood pressure cuff and use it two or three times a week, then share the results with me. A month went by, and he sent me the promised letter with his results. His blood pressure, over multiple readings, was fine. And no more lightheadedness! I wrote him back: "Stay off the medication — it's clear from your readings that you no longer need it." He was thrilled to pare down his list of daily medicines. The decision saved him money and meant he could forget about one of his many daily pills. I'm satisfied the decision to stop this man's blood pressure medicine was a good one. Since the medicine was something he no longer needed, I helped him avoid a drug-related problem like a fall, and, with it, maybe a hip fracture — one of the banes of our aging population. What's more, he and I pushed back against medical inertia, the tendency to keep things the way they are because it's easier than making a change. Inertia is especially strong when a medical treatment conforms to accepted guidelines. There are dozens of guidelines in the world of cardiovascular medicine. Many of them have lifestyle changes as their primary recommendation. All too often, though, people, including doctors, have a hard time improving their diets, losing weight and getting enough exercise. So we resort to medications, often several of them, to treat or prevent illness. Now that the early results from the SPRINT trial suggest that lower blood pressure is protective, the inertia to keep people on blood pressure pills — or to add more of them — will be even stronger. My patient's experience, and stories like his, have led me to believe me that there comes a point in aging when, for many of us, our physiology changes. No doubt there are many factors, such as our senior brains, stiffening blood vessels and changes in the ratios of our hormones. Sometimes the changes bring more illness, but in other cases the problems that afflict patients seem to diminish with advanced age. In other cases, the preventive measures that I recommend as a doctor no longer matter as much. There's not much sense in treating an 80-year-old for high cholesterol who hasn't had a heart attack or stroke already. It's a debatable point, to be sure, and ultimately decisions like these depend on the values of individual patients and an estimate of how long they'll live. So how do we pinpoint this time of change for individuals and what do we do when we get there? 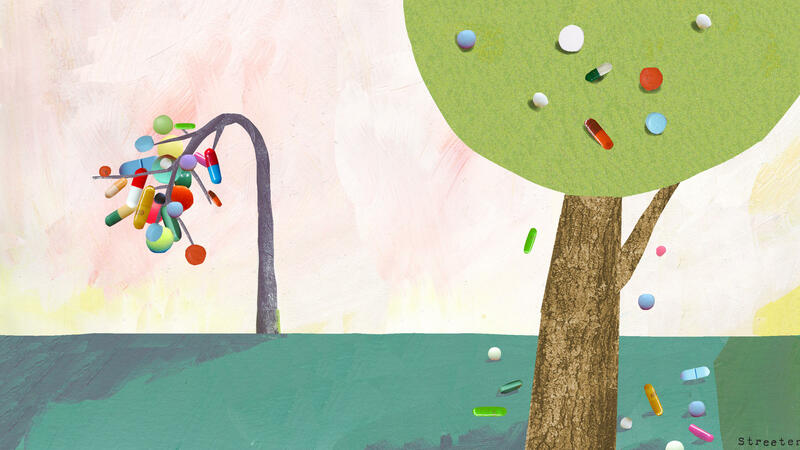 An obvious but often overlooked choice we can make is something that is called deprescribing, which means discontinuing medications in older people who take a lot of them. A recent article in the journal JAMA Internal Medicine examined this idea, reviewing more than two dozen other studies in which medications were discontinued while tracking the effects (or lack of them) on patients. People in the study did surprisingly well having their medications stopped (among them blood pressure drugs and sedatives known as benzodiazepines, such as Valium). Adverse symptoms abated, and patients' health generally improved. As a doctor looking first to do no harm, I draw the following conclusion: Though I'm ready to believe the better low blood pressure outcomes promised by the SPRINT trial, I'm also going to be looking for opportunities to minimize the overuse of drugs in older patients by discontinuing prescriptions whenever possible. For many of us, less medicine means more health.